I’m sure you are right Jenny. Death is a natural process – both words are important. It’s natural that we are born, grow, mature and die. And possibly more important death, which of course can be very upsetting, is an inevitable process and its inevitability means that its impact can be rehearsed. Part of this rehearsal is to talk about it. My wife suffered a cardiac arrest this summer while we were on holiday in Scotland and died a few days later with profound brain damage. My sons and I were extremely impressed by the nursing staff in palliative care at Dumfries Hospital who encouraged us to talk to my wife as they did, even though there was no obvious response. The doctors went to great lengths explaining the details of care and offering us choice where possible. When the time came and my wife stopped breathing I was even hugged by a nurse – all on the NHS! I am so very sorry to hear of your wife’s death Gordon. You must still be reeling from her loss. I found it a very confusing time when my mother died. I simply had not thought about death enough beforehand to prepare me for the event, even though she was 92 when she died. My mother lived on the Solway Coast in southern Scotland, near Dalbeattie and Dumfries and her initial diagnosis for dementia was at Dumfries Hospital. I fully agree about the wonderful care that Scotland provides for the elderly. My mother received daily visits from carers for eight years, all paid for by social services. In her final years she was visited four times a day and in the final week of her life Macmillan nurses provided 24-hour care, again all paid for. Her care was superb and a wonderful support to me and my family since we live a two hour drive away. Like you, I was also consulted by my mother’s doctor in her final weeks, who gently advised me of the choices to be made and the best course of action to take, which was principally to let my mother die in peace – her time had come. I was so impressed by how he did this. I still think about my mother every day, but I do not grieve for her. I am grateful for her life and for the wonderful care she received. Thank you for sharing your experience, which is even more resonant given the Dumfries connection. Thanks Jenny. Not sure I’m a fan of death as a natural process or of it being a disaster. Regardless, death, as you say, is unavoidable and the silence around it leaves dying people cut off and gone before they are gone. There’s also the problem of medical people being the keepers of the knowledge of death. I was told by a doctor who knows nothing of my case that I had no right to claim an experience of death because, obviously, I wasn’t dead. (Ironically, medical records back me up but that was a doctor’s opinion and OTHER doctors can be wrong). Thinking about this, my memory focuses on a very few who mattered at what felt at the time was the end and they were all family and one nurse who was on relief to cardiology from the children’s cancer ward. So maybe the important thing before leaving for good is to be able to say good bye to those who know you? Thank you Scott for your comment. I’m not sure what death is, if it isn’t a natural process. I can see that it might be untimely and a painful process, but ultimately the end of life comes to us all in one way or another? I suppose if it isn’t a ‘natural’ process, then it is an inevitable process. Thanks Jenny and for your interesting account of superlative care in Scotland. Both my mother and her twin sister lived to be 100 in Edinburgh care homes – think I’ll move up there! Scott mentions the importance the importance of goodbyes. It saddens me that circumstances never allowed this in all my experiences of the death of loved ones. 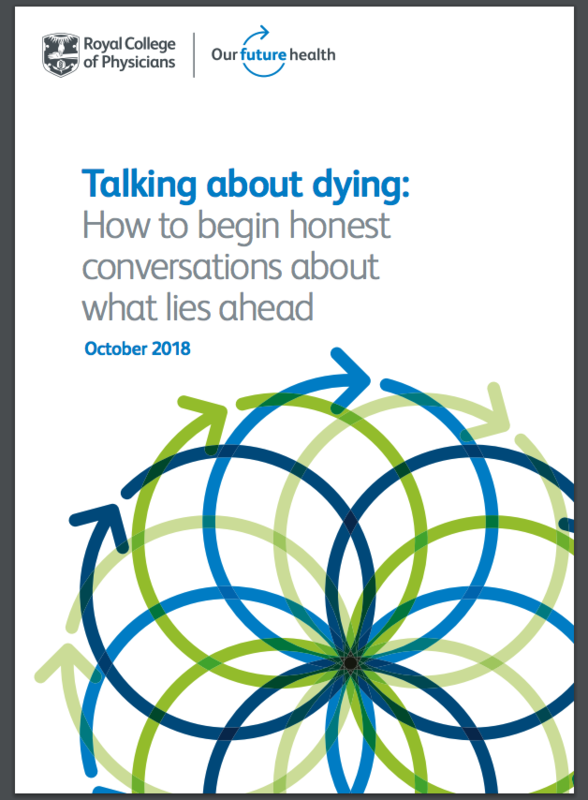 Jenny, agree that death is definitely a natural process that people find difficult to talk about and that unwillingness to deal with the subject leaves those dying, in a sense, abandoned to deal with alone when they most need compassionate support. In my case, the doctors have run out of things they can do to “fix” my heart and I’ve finally had to tell them to relax and let me go on living with the damage and not feel like they’ve failed me. Mistakes were made and this in part makes them hesitant to mention death–the other part might be their unwillingness to seem like they’ve given up on me? Who knows? From a different view, I have a friend with cancer who’s undergoing chemo and radiation and for all the theorizing I find it almost impossible to talk about death with her. Will read the report. Jenny, thanks for your comments. I do have to remember my life has been returned to me twice–by chance and by luck. It makes me too angry to discuss the system so I’ll leave it beyond noting that medical care here is a perfect example of organized ignorance of itself. Feedback goes in and disappears and anything that might seem like criticism, or even valid observation, is fed into dialog utility that’s clearly designed to lead you to understand how wrong you are. Black box I think it’s called. Thank you for sharing Jenny. I think that I was probably in denial as I watched my mother die of cancer. The biggest shock was the body transformation. I cannot think of any film (I have not seen Awakenings) that authentically reflects this. Maybe I was naive? Not sure what I did expect. Was a challenge none the less. One of the most moving things I have listened to. Thank you Aaron for sharing the Oliver Sacks podcast with me. We are lucky to have this technology through which to capture these recordings/thoughts that are important to us. I recorded (video and audio) my mother a number of times during the last years of her life. Even in the last stages of dementia she could still sing extremely well, even though she couldn’t hold a conversation. I also (before the dementia really set in) interviewed her about her life and found out all sorts of things that I didn’t know. I realise that probably my own children don’t know much about my early life and aspirations.